Sweepstakes winners, from left, are Carla Chance, second place; LuAnn Schindler, first place; and Lori Potter, third place. LINCOLN — The managing editor of the Clearwater Journal-Ewing News took home the top sweepstakes award in the 2015 Nebraska Press Women Communications Contest. LuAnn Schindler earned nine first-place awards on her way to the top spot. In addition to her duties for the News, she contributes to the Neligh News & Leader. 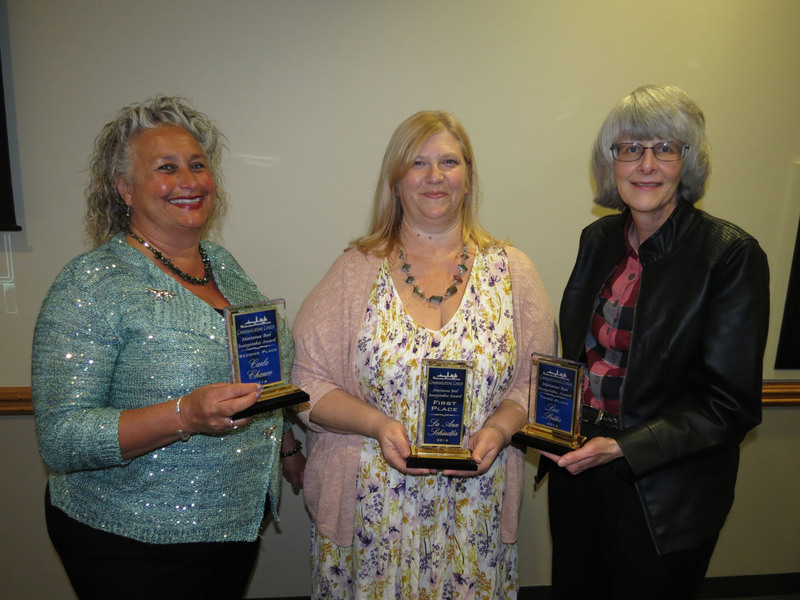 The Marianne Beel Sweepstakes awards were presented Saturday at the NPW spring conference in Lincoln . The sweepstakes awards are named after the late Marianne Beel, a longtime NPW member and contest director. Carla Chance of Cedar Creek, also with nine first-place awards, placed second. She is the marketing and communications director for Video King in Omaha. Lori Potter, a staff writer, photographer and columnist for the Kearney Hub, placed third with seven first-place awards. First-place entries in more than 50 categories advanced to the national level in the contest sponsored by the National Federation of Press Women. Results will be announced at the NFPW annual convention in September in Wichita. — Carla Chance of Cedar Creek (Omaha): first place for direct mail marketing, brochures (corporate), catalogs or manuals, audiovisuals, videos for website (corporate), social media campaign (corporate), infographics, publication editing (magazine or newsletter) and science or technology articles; second place in advertising banners, single advertisement and website editing (corporate); third place in advertising campaigns, business articles and feature story (magazine or newsletter); and honorable mentions in page design (magazine or newsletter) and personality profile (more than 500 words). — LuAnn Schindler of Clearwater: first place in feature story (magazine or newsletter), arts and entertainment articles, government or politics articles, social issue articles, humorous columns, informational columns, general columns, website editing (corporate) and single advertisement; second place in continuing coverage or unfolding news, agriculture articles, environmental articles, health articles, religion articles, sport articles, personal opinion columns, publication editing (newspaper), infographics, news or feature photo and news or feature release (single); third place in news story (newspaper), feature story (newspaper), food articles, hobby or craft articles, headlines, single page editing (newspaper) and photo essay; and honorable mentions in personality profile (500 words or fewer), personality profile (more than 500 words), education articles and sport photo. — Bette Pore of Grand Island, senior editor for the Grand Island Independent: first place in editorial/opinion (newspaper), headlines and page design (newspaper); second place in single page editing (newspaper); and third place in personal opinion columns. –Leslie Means of Kearney, co-founder of Her View From Home and contributing columnist to the Kearney Hub: first place in blogs (corporate); and second place in humorous columns and general columns. — Lori Potter of Kearney: first place in special series, history articles, environmental articles, agriculture articles, general photos, sports photo and photographer-writer; second place in news story (newspaper), feature story (newspaper), education articles and photo essay; third place in personality profile (more than 500 words), general columns and news or feature photo. — Barb Batie of Lexington, freelancer and columnist: first place in news story (magazines or newsletters), personal opinion columns and education articles; second place in feature story (magazines or newsletters), and science or technology stories, third place for humorous columns; and honorable mention for general columns. — Jesse Harding of Kearney, assistant farm director for KRVN and the Rural Radio Network in Lexington : first place in special programming (radio), prepared report (radio) and interview (radio). — Fran Benne of Lincoln, design and communications specialist for the University of Nebraska-Lincoln: first place for newsletters (nonprofit, government or educational). — Mary Patt Finn-Hoag of Norfolk , agriculture and youth editor for the Norfolk Daily News: first place in feature story (newspaper) and news or feature photo. — Lori Clinch of North Platte: third place in humorous columns. — Heather Johnson of North Platte, area communications specialist for Mid-Plains Community College: first place in news or feature press release (single), news or feature release (multiple) and magapapers/tabloids. — Sherry Thompson of Omaha, communications consultant: first place in reports and social media campaigns (nonprofit, government or educational). — Terri Hahn of Osceola, features editor for the Grand Island Independent: first place for section editing (infrequent); and second place in personality profile (more than 500 words), headlines, single page editing and page design (newspaper). — Delores Meister of West Point, freelancer and correspondent for the Norfolk Daily News: first place in news story (newspaper), continuing coverage or unfolding news and religion articles; second place in arts and entertainment articles; and third place in education articles. — Mary Jane Skala of Abiquiu, N.M., freelance columnist for the Kearney Hub: first place in home articles, sports articles, business articles, health articles and personality profile (more than 500 words); and third place in personal opinion columns.